Humidifiers seem pretty harmless, right? In fact, they can be extremely beneficial if you live in a desert climate or if you have your heater running often during colder weather. However, running a humidifier often or improperly can cause significant water damage to your home. Plus, when you finally do notice the damage, your home might already be damaged and you’ll need to hire the best water damage restoration companies in Roswell to repair your home and bring life back to normal. Here are some of the ways that a humidifier might be damaging your home. It’s a big word, but bioaerosols are tiny microorganisms that get suspended in the air through humidifier mist. Bacteria and mold are two bioaerosols that sit inside the moist environment of the humidifier. This bacteria and mold grows and spreads faster if you leave the humidifier on between uses or don’t clean the tank between uses. To combat this, make sure you’re cleaning the tank thoroughly between uses. Nice, moist air is typically more comfortable to breathe than dry air is. However, excessive moisture is generally considered bad for your health and especially for your home. Moisture damages walls, paint, insulation, and ceilings. It makes your ceilings more susceptible to leaks. 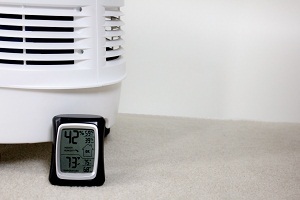 If you have fog on the windows in the morning after running the humidifier all night, or if the carpet and furniture surrounding your humidifier feels damp to the touch, you’re probably making your home too moist. If you have a humidifier in your home, it’s imperative that you use it properly and that you’re looking out for the warning signs of water damage. Something as innocuous as a humidifier is not something that homeowners usually suspect of causing problems, but they happen nonetheless and you need to be watchful if you choose to operate them. If you have water damage, it’s important to contact water restoration companies in Roswell to assess the damage and provide guidance for avoiding further water damage now and in the future.